What do you know that takes 3 minutes and is mess-free, healthy and great for any time of the day? Oh, and did I forget the mention – ohhhhh so chocolatey!! You might have seen a horde of ‘Chocolate Mug Cake’ recipes dotted around the webosphere, but most are either loaded with unhelpful wheat flour, tonnes of sugar or – if truth be told – they just plainly DO. NOT. WORK. What I mean by this is they either explode in the microwave, or come out too runny. 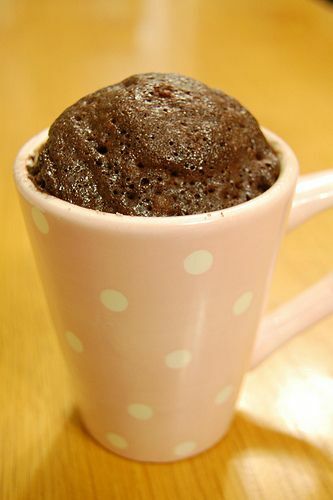 What you want from a mug cake is something of a mousse-y consistency and just enough sweetness to not make you crave more… and I think I found it with this healthy chocolate mug cake recipe from Creek Line House. It’s so easy – all you have to do is a mash a ripe banana. Throw in two tablespoons of cocoa powder. ½ a teaspoon of cinnamon. Instead of apple sauce (which is laden with sugar, and is basically just as calorific as jam) I added a tablespoon of date sugar. This is special stuff – and I recommend buying some ASAP despite it being pretty pricey – as you’ll get loads of use out of it, and it’s really worth the price tag. Date sugar is so crazy amazing because it’s not actually sugar, it’s an extract from dehydrated dates and makes for a great sugar alternative. Dates are also one of the best fruits for IBS relief due to their high fibre content, which can help relieve symptoms of IBS-C. If you also find you suffer with chronic bloating, date sugar can help curb this due to its high magnesium content, making it the perfect anti-inflammatory remedy. (Alternatively, if you don’t want to pay for the date sugar, you can make your own – just follow this amazing recipe). Mix it all together and microwave in the same mug for around 2-3 minutes (for a consistency along the lines of chocolate mousse), or 3-4 minutes (for something more like creamy chocolate cake). NOW DIG IN! You deserve a guilt-free treat, done the IBS way! Next Entry Are Rice Krispies Healthy?